31'' x 12'' x3'' Polished Aluminum Bar and Plate FMIC Front Mount Intercooler. Brand new universal front mount intercooler. Made of high quality T6061 aluminum. High flow and light weight. Support up to 600HP and 40PSI. Compress air flow rate: 700cubic feet/min. Pressure drop: 0.2-0.5 at 15PSI, 2-5 at 40PSI. Full size: 31.00" (L) X 12.00" (H) X 3. 00(W) 3 Inch Inlet/Outlet. Core size: 23.50" (L) X 12.00" (H) X 3. Professional installation is highly recommended! Item exactly the same as picture shown. Universal fit and modification is required! We reserve the right to choose the service. · Its our goal to provide 100% satisfaction to our customers. Item must has their original packaging, no signs of being installed or mounted, used, cut wires or scratches. Item must be original saleable condition (which is determined solely by our company). However, it is required that you provide a photo to show us the problem before we issue a return label for you. · All of our items are made by OE approved manufacturers and they were tested in factory. All damaged products are considered damaged during transit (even though outer box is not damaged). Please inspect and hand-fit all items by the time it arrive. No claims will be accepted after 7 days. However, if the claim is denied, we will NOT be responsible for the lost package (this does not apply to damaged item). Be sure to clearly indicate the reason of requesting a product return. This includes, but is not limited to, no signs of being installed or mounted, no cut wires, no scratches. It is the sole responsibility of the customer and/or installer to confirm the correctness of size and application before installation. · After we received your return item, we will verify the problem and open the inspection process. Please given a reasonable amount of time allow us to process your return item. · We do not make the products, installation instructions are not included in most cases. Please consult with mechanics who has experience installing aftermarket products. · We are not obligated to provide installation guide. We might or might not have the installation instruction for the item we sell. We strive for 5 star service. We can also be reached at. And one of our representatives will assist you with the return process. All we ask is that you send the items back to us within 14 days upon receipt in the original packaging, and make sure that the merchandise is in the same condition. Thank you for viewing our listing and taking the time to read our terms and conditions of the sale of our products. Powered by Solid Commerce The All-in-One Listing, Inventory & Order Management Solution. 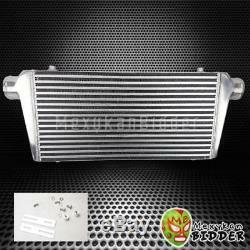 The item "31'' x 12'' x3'' Polished Aluminum Bar and Plate FMIC Front Mount Intercooler" is in sale since Wednesday, January 11, 2017. This item is in the category "eBay Motors\Parts & Accessories\Car & Truck Parts\Turbos, Nitrous, Superchargers\Turbo Chargers & Parts". The seller is "mexykanbidder" and is located in Rancho Cucamonga, California. This item can be shipped to North, South, or Latin America, all countries in Europe, all countries in continental Asia, Australia, South africa, New Zealand, Egypt, Reunion. Interchange Part Number: Universal fit and modification is required! !